Whenever a game releases there are always people who aren’t content to live within its boundaries. Videogame worlds are governed by strict rules, so naturally there are people always looking for ways to break them. 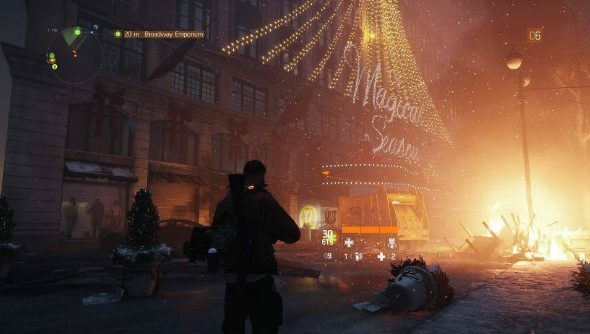 The Division is no different, and some players have already found a way to break free from its Midtown Manhattan prison. If you enjoy a similar freedom, have a look at our list of PC’s best sandbox games. A YouTuber who goes by the name of Chaz has helpfully put together a tutorial video explaining how to glitch your way out of the map, running at a chain-link fence in just the right spot and leveraging the ballistic shield to trap yourself and force your character model through textures. Once through a series of featureless boxes you find yourself in another area of New York, some of which looks hand built in preparation for future content. You can even get all the way to Central Park, though the video doesn’t spoil what you’ll find when you get there. (I will though: it’s floating trees). I just saved you lots of effort. Meanwhile, a Redditor has uncovered a massive aircraft carrier, which probably wasn’t built and placed outside the map just for the crack. Have a look at that on Imgur.